This flight was the continuation of my round the world adventure. You can read my previous installments here and here. 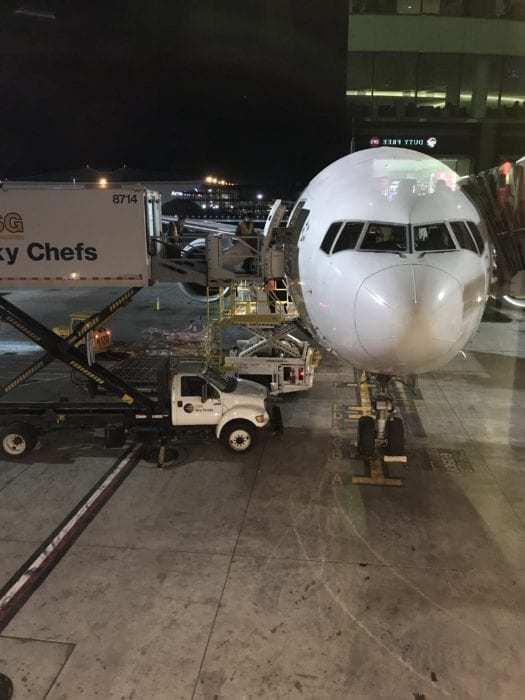 After a wonderful day in Los Angeles with friends, I got ready for my long-haul flight to Auckland. Normally, I book flights through a travel site like Google Flights, from the airline directly, or American Express. In this case, I made an exception. After getting in contact with a travel agent, I ended up getting an excellent package fare around the world. If you were to book this flight as a one-way ticket, you can expect to spend about $2,800 to $3,300 in premium economy. It is worth noting that the leg from Los Angeles to Auckland on NZ1 is a continuation from their flight to London. Their second daily flight, NZ5 does not come from London and is instead a turn around coming in from Auckland. 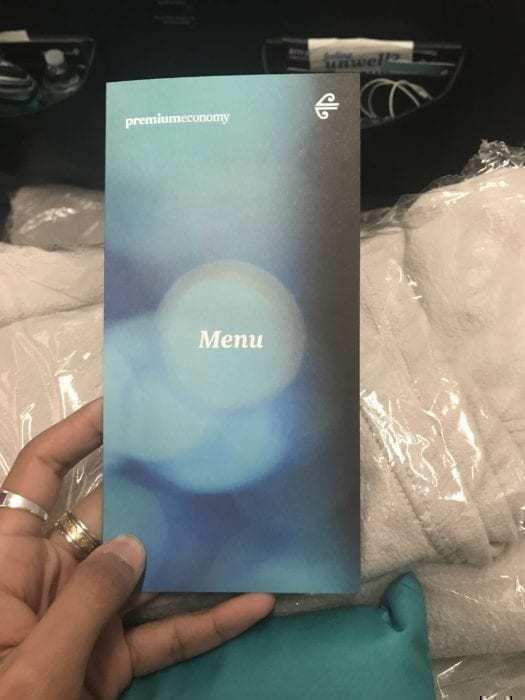 At this point, it is worth noting that a one-way ticket in premium economy is fairly expensive considering a round-trip ticket is about the same price as a one-way on Air New Zealand. Your other option is American Airlines. They usually charge less than half of Air New Zealand for a one-way ticket. I had to check-in at the airport. The process was simple, easy, and quick. From there it was off to security and I was through within 20 minutes. It’s worth noting that lounge options were a bit limited at this point. Premium Economy passengers do not get lounge access with Air New Zealand, but I did have a Priority Pass membership thanks to my Platinum Card from American Express. At LAX’s international terminal, there are only two Priority Pass options. One is the Korean Air lounge which only allows Priority Pass members until 6:00 pm. The other is P.F. Chang. Priority Pass members get a $30 credit at P.F. Chang’s, which can get you a decent meal with a few drinks. A huge shout out to the gate agents for my flight to Auckland! This was perhaps the first time I had seen a boarding process so efficient. There was no crowding around the gate and people were called up in batches based on their class and elite status. If only other carriers could follow suit…. To get to my seat, I had to pass through a mini-cabin of business class. Business class was entirely full, mostly from those flying in from London. When I was booking these flights through a travel agent, I was presented with an option on Air New Zealand. Business class was pricing out to add almost $2,000 more to my package than premium economy class. In the end, I’m glad I didn’t choose the upgrade. The seats were not as wide as other business class seats and the herringbone configuration was incredibly exposed. The aisles were also incredibly narrow as was the footrest. After being quickly ushered through by flight attendants due to the sheer number of people behind me, I made it to my seat: 23K. When I got to my seat, I was asked if I would be willing to switch seats to allow a couple to sit together. When I asked where my seatmate’s spouse was seated, I was told they were in a middle seat towards the rear of the premium economy cabin. 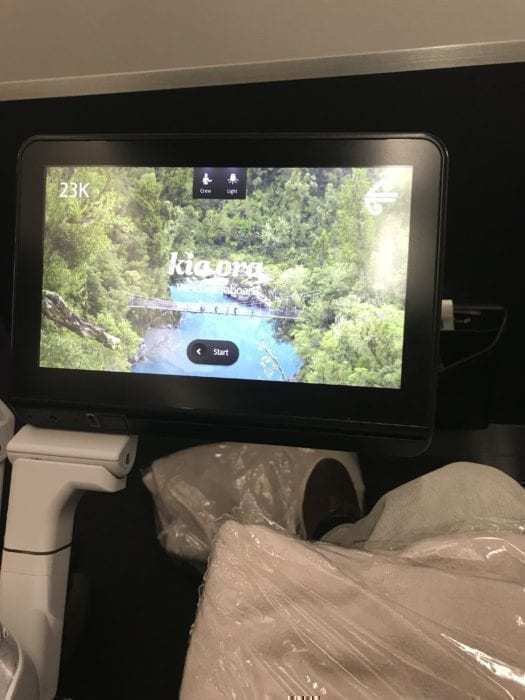 Given that I had paid an extra $100NZD for this seat, the 12-hour and 37 minute flight time ahead, and the number of young children towards the rear of the cabin, I politely declined and that was the end of the matter. I located all of the relevant controls for the seat. The recline button was on the right-hand side armrest and the controls to release the video monitor and leg rest were on the left-hand side armrest as visible in the picture above. Near the leg rest was a power outlet. There was a remote control that could be detached from the armrest. 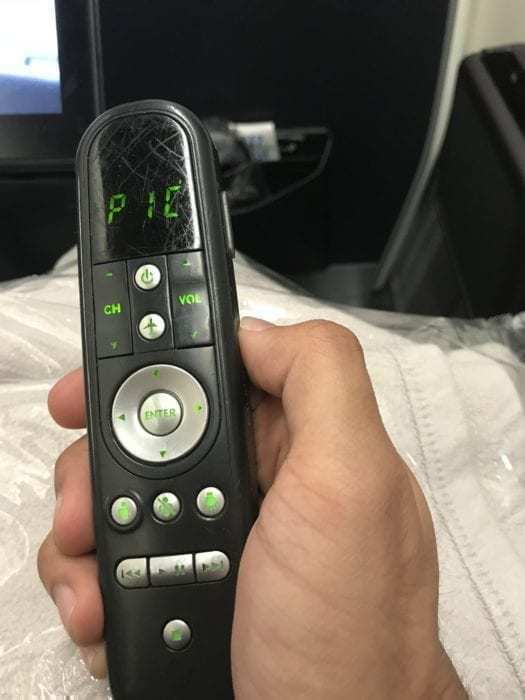 Remote control in premium economy. You can probably tell from the picture, but this remote control had seen better days. It was well scratched and dinged up. Not the best presentation, but the remote did work very well and I ended up using it during the flight. The seat also had a legrest and footrest. Leg rest and footrest in premium economy. This turned out to be a comfortable seat. I ended up getting about 8 hours of sleep on this flight, which was a welcome surprise. The footrest could be extended by flipping the switch on the leg rest. I’m 5’8″ and I had to seat myself a little crooked in order to get my feet on the footrest. If you’re taller, you might find it more comfortable without deploying the footrest. Waiting at my seat after boarding was a water bottle, amenity kit, blanket, pillow, and a set of headphones. 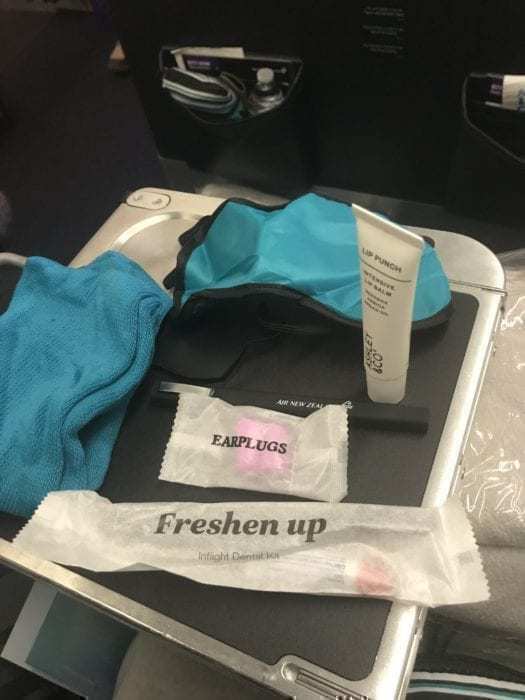 Air New Zealand amenity kit in premium economy. The amenity kit was stocked with the basics, but yeesh, everything was crammed into a very small pouch. I wasn’t a fan of receiving a crumpled up eye mask and pair of socks. I did appreciate the lip balm as the long flight can dry out lips easily. 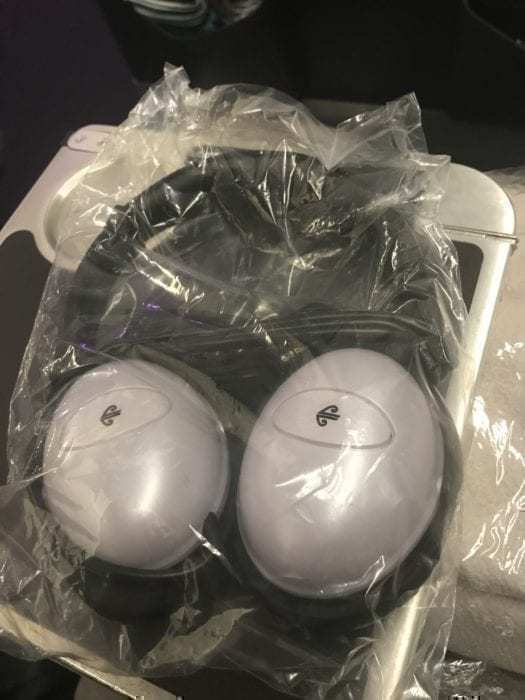 Air New Zealand headphones in premium economy. The headphones provided were pretty standard for premium economy. I’d say they were about the same quality as the LSTN headphones I’d received on previous Delta flights. Air New Zealand in-flight entertainment system. The monitors were crisp, clear, and easy to use. Although it seemed bulkhead seats had smaller screens than oher premium economy seats. I did notice that some monitors welcomed the passenger by name. I learned that this was the case only for passengers who were continuing on the flight from London. Since I originated in Los Angeles, I didn’t get the same reception. The entertainment selection had a solid quantity of films, shows, games, and music. There was definitely enough content to keep a person entertained for the entire length of the flight. Air New Zealand offered a wide array of content on this flight. The monitors were unlatched in order to show the safety presentation and oh my gosh was that an adventure. Someone at Air New Zealand decided that it would be a great idea to release a safety video….that was a rap song. Had I never seen a safety briefing in my life before, it would be safe to say that even after seeing the Kiwi Safety video, I still wouldn’t know what to do in case of an emergency. I could go on, but I’ll save that for when I have to watch this video again for my flight to Nadi. 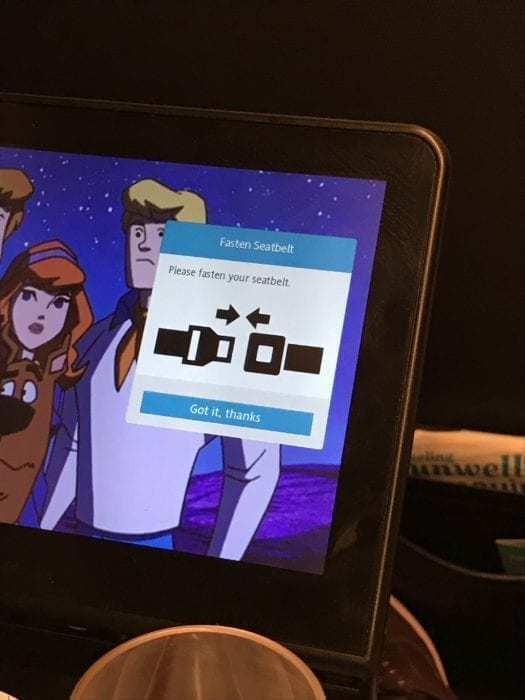 The monitor also reminded me to fasten my seatbelt whenever the sign was turned on. A gentle reminder to fasten my seatbelt whenever the sign was turned on. 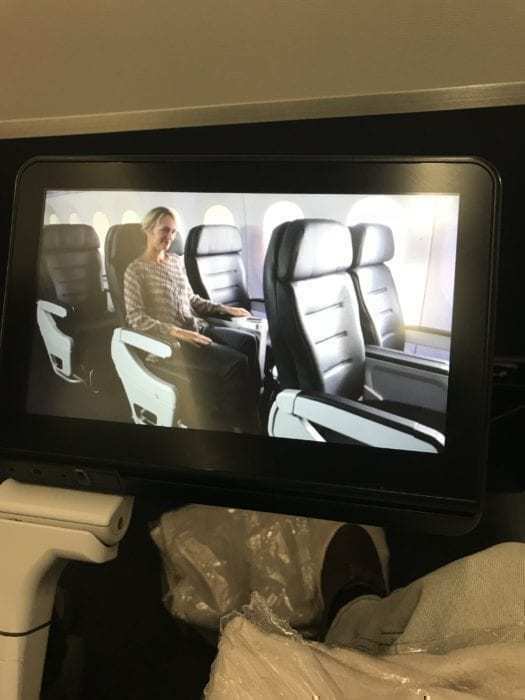 For those new to premium economy, there was a video that demonstrated all the features of the seat. There was a video available that demonstrated all the features of the seat. There were two lavatories available for premium economy passengers. Before and after meal services, there was a line of people waiting to use it. However, inside the lavatory, there was a nice(?) 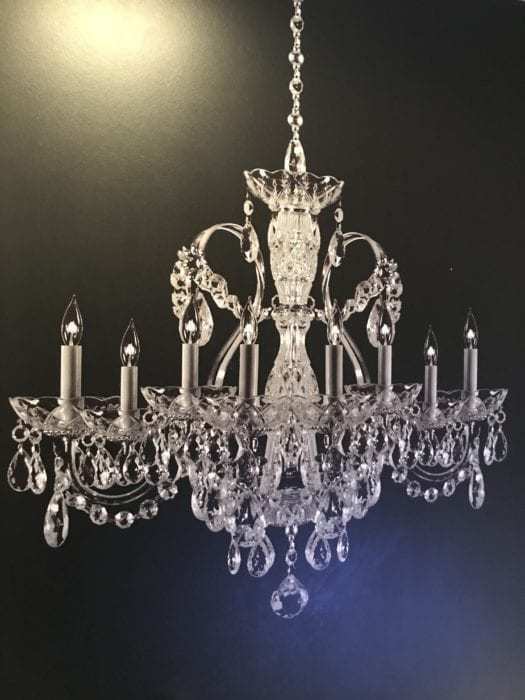 wallpaper of a chandelier. 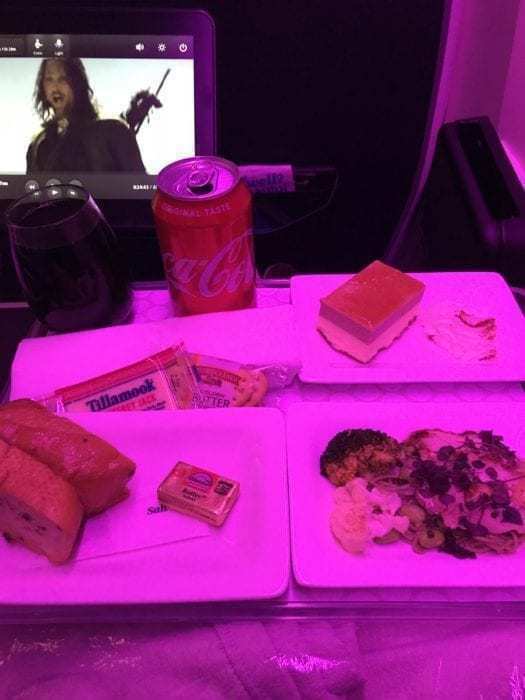 Shortly after takeoff, I was offered a tray with the starter and dessert. Starter, dessert, and bread tray. The starter was exceptionally cold and was not very well seasoned. Unfortunately, this would turn out to be a recurring theme with Air New Zealand. After about 20 minutes, the main course was offered. I selected the seared cod option. Thankfully, the main course was warm. However, it lacked any kind of flavor. I wasn’t terribly impressed with the meal and given the strange presentation of the meal (serving dessert and appetizer together), I felt underwhelmed with this presentation. 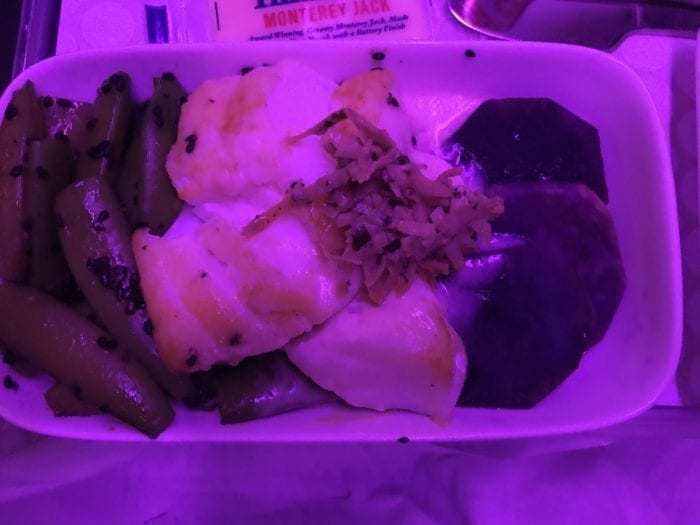 All in all, the first meal service was completed within 90 minutes after takeoff which was nice for this long-haul flight. 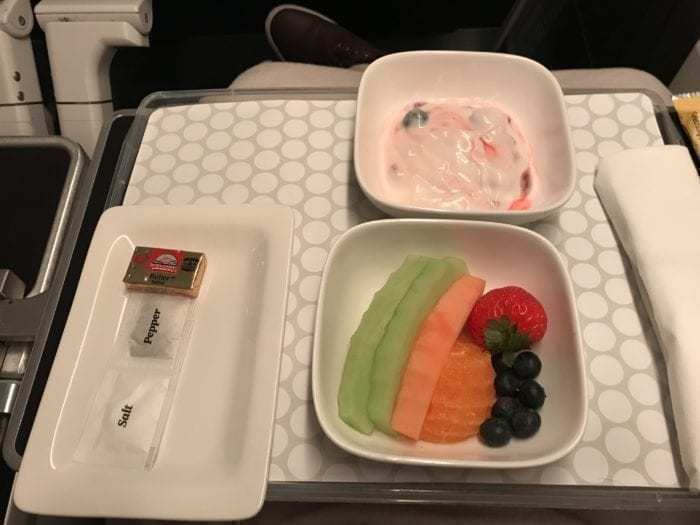 About two hours prior to landing, the breakfast service started. 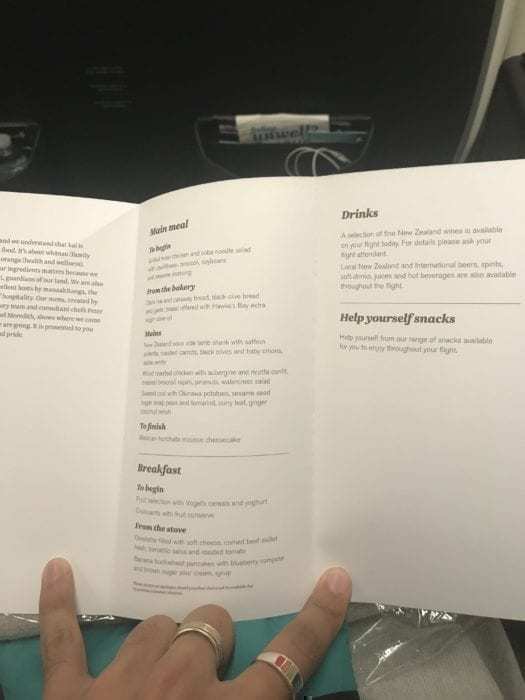 Air New Zealand breakfast starter. Like the first service, the side dishes were served well before the main course. When the time came to choose the main course, I went with the omelet option. 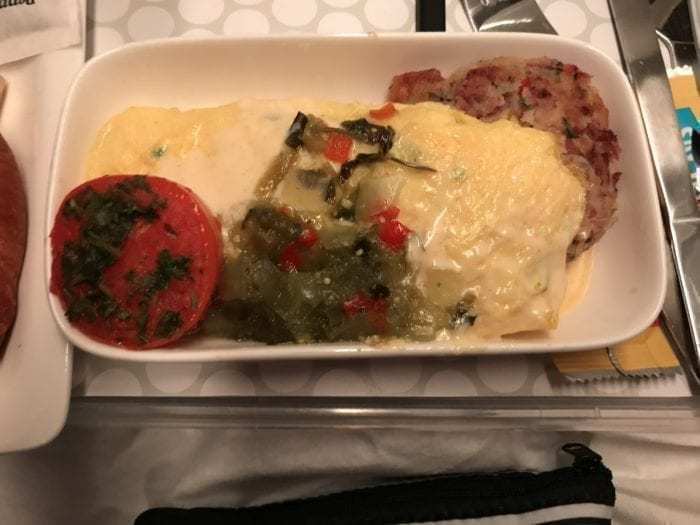 I’ve rarely had an egg dish on a plane that was good. Air New Zealand was no exception. The omelet had zero salt and lacked almost any real flavor. Disappointing, but at least the more edible starters came in a generous quantity. And with that, the dish was served on my tray. I also had an interesting encounter after waking up during the flight. After a solid 8 hours of sleep, I woke up and discovered one of the flight attendants standing in the aisle and just staring at the passengers. When I made my way to the lavatory, he didn’t move or acknowledge my presence. It was a wee bit creepy. This was a pretty standard premium economy flight. In fact, it was so standard that there wasn’t anything terribly exceptional about the flight. 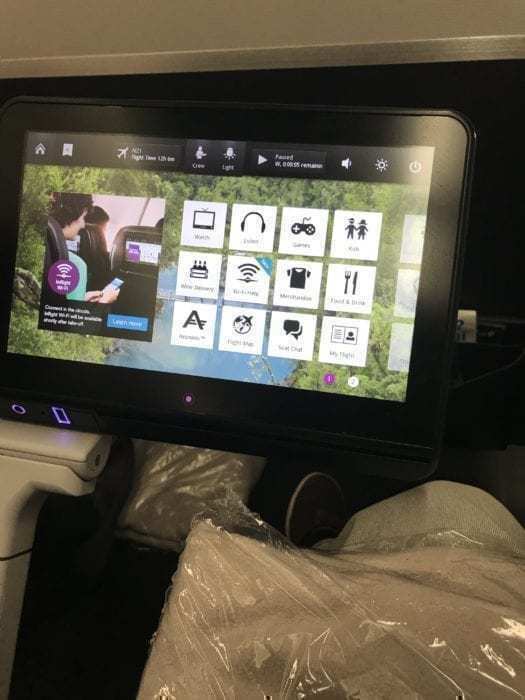 Given that premium economy across airlines tend to be very similar experiences, the one way that Air New Zealand could have made an effort to stand out would have been through providing exceptional service. Should Air New Zealand maintain their higher pricing, I probably would not book with them in the future for this route. Nothing really made me want to come back and fly with them again. 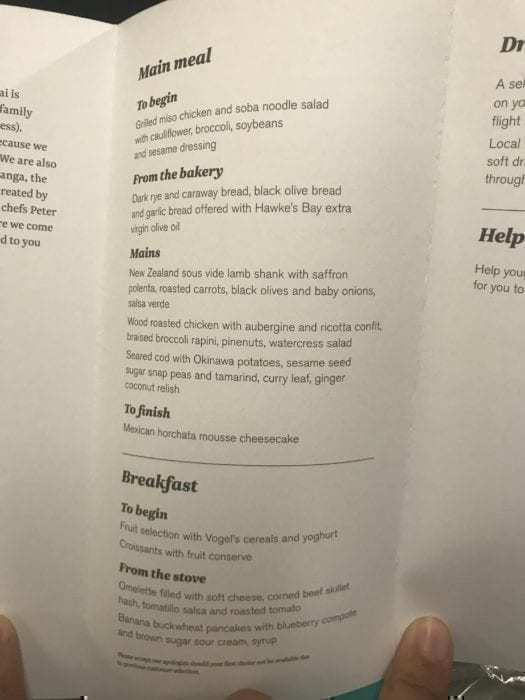 That being said, I would be interested in testing Air New Zealand’s business class. Have you flown with Air New Zealand? Do you want to fly Air New Zealand? Let us know in the comments! The other is P.F. Chang. Priority Pass members get a $30 credit at P.F. Chang’s, which can get you a decent meal with a few drinks. – wow that made me laugh!! Would you recommend the bulk head window seats in row 23 over the window seats in the other rows? Is it worth the extra charge over say rows 27 or 28? 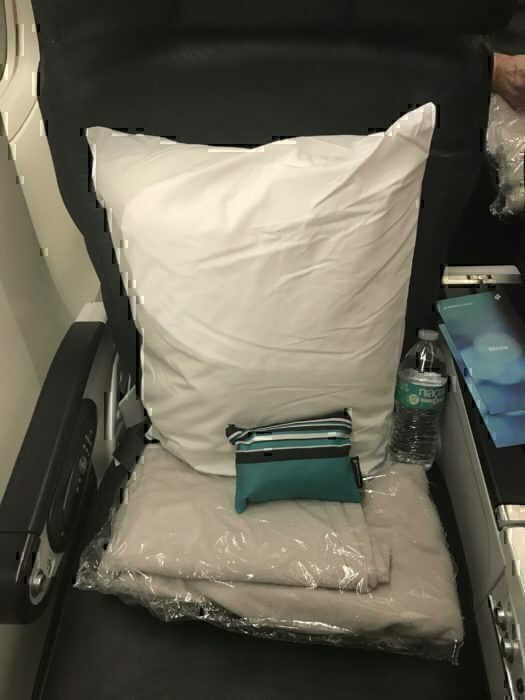 Did you notice if there was additional leg room at the bulkhead or less than the non bulkhead rows? If you are traveling alone I would highly recommend it. 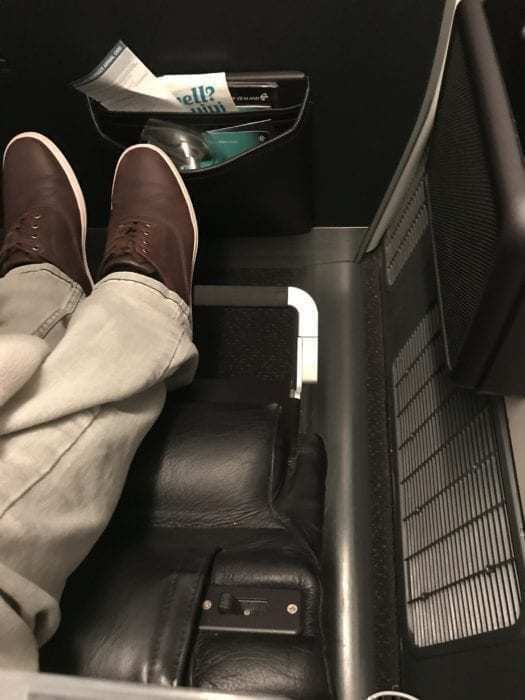 There is not a vast difference in legroom from the bulkhead compared to other rows, but it is still enough to make it easier to get out of the window seat without affecting your seatmate. You also get served first and your meal orders are taken first so there’s less chance of them running out of your preferred meal onboard. Hope this helps!